Simple elegance. The Vault Dining Table’s terrazzo tabletop exhibits various tones of black to complement its thick iron base. 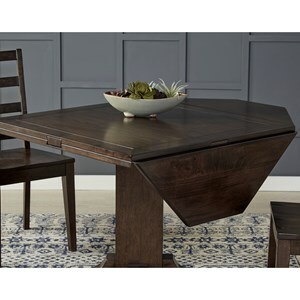 The round design of this table accommodates smaller dining spacing, while not compromising on style. Seats 4-6 People. 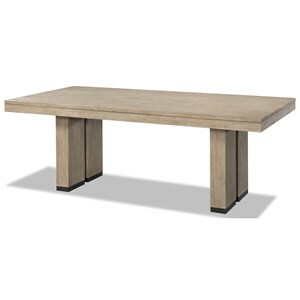 Minimalistic iron base Each terrazzo tabletop will very due to natural changes in stone size. Contemporary Modern Style. Part of Vault collection. Dimensions: 47.25"W 47.25"D 30"H. Product weight: 101.5lbs. Color: Dark Brown. Assembly is not required. Made in Vietnam. We are offering 1 year limited warranty (covered for any manufacturer's defect). Construction: Lavastone Top. Frame: Iron Base. We understand how important your home is and how decorating your kitchen, dining room or bedrooms with classy, contemporary furnishings can help make it a place that reflects who you are. We believe in the power modern furniture has in creating not just a home but YOUR home. We believe in feeling good about our home's environment, and we think you do too. The Vault Contemporary Dining Table with Terazzo Top by Moe's Home Collection at Williams & Kay in the Anchorage, Mat-Su Valley, Eagle River, Alaska area. Product availability may vary. Contact us for the most current availability on this product. Browse other items in the Vault collection from Williams & Kay in the Anchorage, Mat-Su Valley, Eagle River, Alaska area.